The North Carolina Department of Environmental Quality issued a 401 water quality certification on Friday that is required for the Atlantic Coast Pipeline project to move forward in North Carolina. Projects that will impact wetlands, buffers or waterways must obtain this certification. Since Atlantic Coast Pipeline, LLC applied for the 401 certification in May 2017, staff with DEQ's Division of Water Resources have conducted a review of the project plans, requiring the company to submit additional application information on five occasions. As part of the review process, DEQ held a public comment period June 16Aug. 19, 2017 and public hearings in Fayetteville and Rocky Mount. "DEQ left no stone unturned in our exhaustive eight month review of every aspect of the 401 application," said DEQ Secretary Michael Regan on Friday. "Our job doesn't end with the granting of the permit but continues as we hold the company accountable to live up to its commitments. Our efforts have resulted in a carefully crafted permit that includes increased environmental protections, while giving us the tools we need to continue close oversight of this project as it moves forward." - Stream and Wetland Monitoring: Upon restoration of temporary impacts, restored areas must be monitored for three years with photo documentation. DEQ may extend monitoring requirements. - Work in the Dry: Unless an exemption is granted for a specific location, all stream-crossing construction activities must be conducted using best practices to divert water and limit potential sediment pollution in streams. - Horizontal Directional Drill: To better protect the Neuse River and its riparian buffers, the project must use a horizontal directional drill for crossing the waterway. - Documentation of Drilling Components: The composition and properties of drilling fluids and additives for each horizontal directional drilling crossing must be submitted to DEQ and will be available online for public access. - Well Testing: Private well testing will be required before and after construction within 150 feet of the disturbed area or 500 feet from blasting areas. Testing after impacts must be conducted by an independent qualified groundwater specialist. - Regular Inspections: DEQ water resources and erosion control staff will conduct monthly onsite inspections of pipeline construction activities. - Construction Stormwater Protections: Though not required by state or federal regulations, the project will obtain coverage of and meet the requirements of the state's construction stormwater permit for the entire construction corridor in North Carolina. Atlantic Coast Pipeline, LLC must still obtain from DEQ an air quality permit for a compressor station in Northampton County, two general stormwater permits for impacts in Nash and Cumberland counties, an individual stormwater permit for a contractors' work yard in Cumberland County and approval of the erosion and sediment control plan for the northern segment of the pipeline's North Carolina route. The erosion and sediment control plan for the southern segment was approved in December. At the federal level, the project must also obtain a 404 permit from the U.S. Army Corps of Engineers for stream and wetland impacts. The Federal Energy Regulatory Commission is the lead regulatory agency for natural gas pipeline projects. That agency approved the Atlantic Coast Pipeline October 13, 2017 following a public review of the project's environmental impact statement and a public comment period. 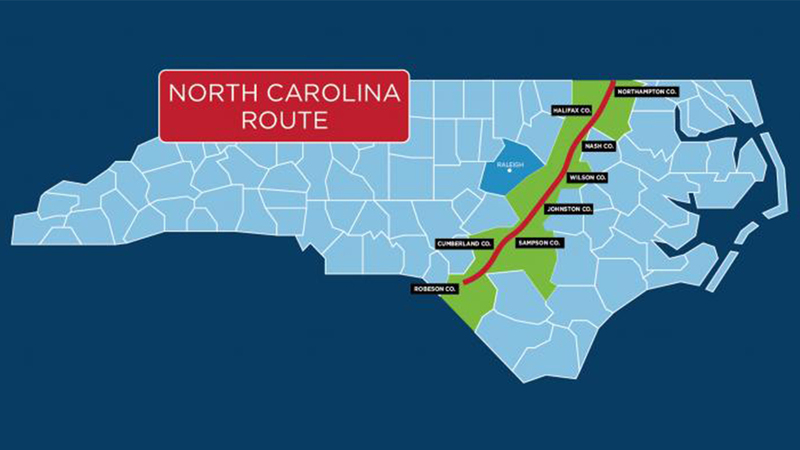 The Atlantic Coast Pipeline project will include 604 miles of new natural gas pipeline and related facilities as it runs from West Virginia to southeastern regions of Virginia and North Carolina. For more information on the pipeline project or to review the 401 permit and approved erosion plans, click here.